There’s nothing quite as "comforting and warming" as a nice bowl of soup. 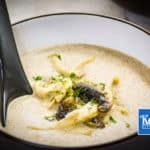 We’ve created this Classic Keto Cream of Mushroom Soup to soothe the soul. In a large saucepan, place the butter, leek and garlic and saute over medium heat. When the leek has softened, add the quartered mushrooms and stir, continue to cook for 2 minutes. Add the tamari and chicken stock and simmer for 15-20 minutes. Remove the saucepan from the heat and add the cream and pepper. Blend together using an immersion or stick blender until all ingredients are pureed. If using the optional ingredients; place the butter and salt into a non stick frying pan over high heat. Add the sliced mushrooms and saute for 3-5 minutes until cooked through. Ladle the soup between bowls and garnish with the sauteed mushrooms before enjoying!